The University of Vermont women’s hockey team hosted their annual “Pack the Gut” night Friday, where they try to break the regular season Hockey East attendance record of 2,136 fans at their home rink, Gutterson Fieldhouse. A less-than-record-breaking 1,967 fans showed up in Burlington, Vermont to watch the Catamounts (7-17-4, 5-14-2) fall to Boston University 7-2. “It was an all around effort in front of a really fun crowd,” BU (15-6-6, 12-5-5 Hockey East) head coach Brian Durocher said. Vermont got a point on the board first against the Terriers, with Catamount defender Sini Karjalainen lighting the lamp 4:19 into the period. The freshman scored her first goal of the season, giving the Catamounts the early 1-0 lead. BU equalized about eight minutes later, with junior forward Deziray De Sousa picking up the goal during a BU power play. Senior tri-captain Reagan Rust picked up the helper. 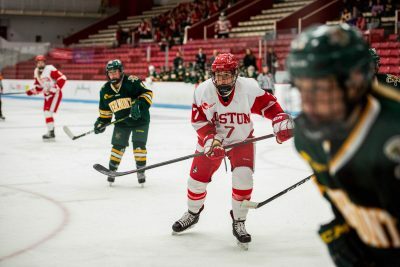 After that BU would overwhelm Vermont, by taking back the lead right before the Catamounts eyes — similar to what they did against Merrimack a week ago. One minute and 48 seconds later, freshman winger Mackenna Parker got BU back in front, with redshirt junior tri-captain Sammy Davis picking up an assist. Davis would go on and get her own goal at the 16:12 mark in the period, with sophomore forward Jesse Compher getting the assist. The middle stanza saw freshman forward Emma Wuthrich extend the BU lead to 4-1, and then Compher collecting one of her own to make it 5-1. Forty-five seconds later, another Catamount would pick up their first goal of the season — defender Anna Erickson, who cut BU’s lead to three. BU did not let Vermont gain any more ground in the third stanza. Goals from sophomore forward Kristina Schuler and another goal from Wuthrich gave BU a 7-2 lead. The score stayed this way through the end of the game, with BU putting up a dominant defense for the remaining 15 minutes. BU outshot Vermont 29-18 in the game, and BU sophomore goaltender Corinne Schroeder kept 16 of the Catamounts’ shots out of the goal with eight of those saves coming in the third quarter. Davis collected her 18th goal of the season, and now has a four goal lead over Compher in most goals scored. Compher collected her 14th goal of the season. With this game, BU extends their unbeaten streak to eight games. They have not lost a game since Jan. 5, a 0-1 loss against the University of Maine (14-10-3, 7-10-3 Hockey East). Up next, the Terriers will head to the Bright Landry Hockey Center at Harvard University Tuesday to face Northeastern University (20-3-3, 18-2-2 Hockey East) in the 41st annual Women’s Beanpot. With the Beanpot now the next target in sight, Durocher said he knows the team can compete against Northeastern. The team hasn’t won against the Huskies this season, with a loss and a draw at home and a loss on the road.